They have been trading their ceramics, basketry, and other products since the 1700's. 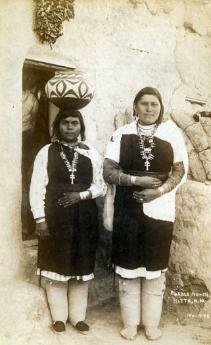 Did Males or Females Make the Zuni Pottery? 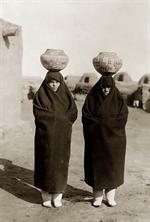 and imitation of their mother, aunts, grandmothers, or other adult females in the village. and skill level. Specific ages are rarely given. innovation among Southwestern farming communities. that the ingredients are at hand. 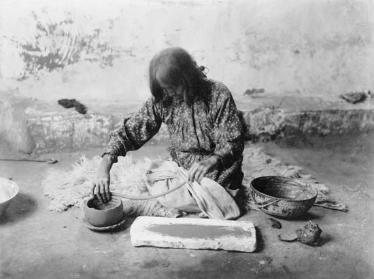 Why Did Zuni Cooking Pottery Increase To Very Large Sizes? of these stews. Large bones are left in the stew when served in communal bowls. agricultural products at any period. boiling—placing one pot within another, which required very large cooking jars. in cooking jar and serving bowl sizes recently noted for the late prehistoric Pueblos. also have played important roles. frequenting his store preferred these, therefore influencing future designs. 20,000 Indians lived there in 1500.